As a soccer coach you will love this U7 Drill! Soccer Coach Fun - the color game! As a soccer coach you need to be able to produce fun drills whilst also making them challenging and allowing the kids to learn or adapt skills and techniques. Take a look at the diagram below for the color game. It's really simple, all you need are half the players in one color and half the players in another. You will also need a bunch of soccer balls. I really enjoyed using this drill as a soccer coach. It gets the players thinking about what they need to do next, being proactive rather than just reactive all the time. The players are split into two teams and have different color shirts/jerseys. The idea of the drill is for the players with the ball to dribble around the area and only pass the ball oncea player with a different color shirt wants the ball passed to them. Players may only pass the ball to a different colored team member. Once a player has passed the ball, they must run off in another direction and find an opposite colored player to pass them the ball. A simple progression for this drill can be for the players to not only pass directly to the other player but to pass the ball into space for the other player to run onto. You could also use cones in the area for the players to avoid and use as static opposing players. The best ones to use are the scissors (step-over) to escape. Other skills include the matthews/donovan, Ljungberg and Rivaldo turn (if you have no idea what these are... please go to the 'Skills & Tricks' page of my website). You can also use this drill to practice turns. The dragback turn, Cruyff turn, Inside and Outside hook work really well here! -> Make sure the kids use little touches and demonstrate at every new coaching point. -> Demonstrate the correct technique for passing the ball. ABC of passing. 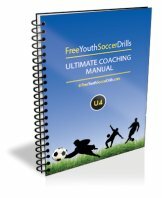 Are you a soccer coach looking for other drills? Click Here!